Its been a while, but this place is worth mentioning. 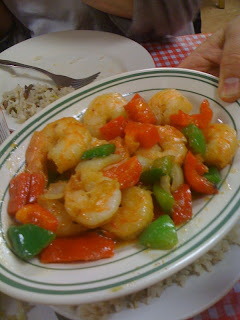 We took the 1 train up to 157th Street yesterday, and headed two block north to Margot Restaurant at 159th St and Broadway (3822 Broadway, New York, NY 10032-1547, 212- 781-8494). Its a pretty quick trip from the Upper West Side. The place is a tiny hole, but the food was quite good, and some of it was a clear step up over places south of 96th Street. Good dishes included the Masitas of pork (fried pork chunks), Shrimp with garlic sauce, pepper steak (which I normally don't even like), and Moro (rice with peas). Fried Yuca was not be missed. The only thing I didn't love was the stewed fish, which was well, fishy. Dessert was good, but you should share it. They don't take reservations, but you might want to call ahead anyway to see how they are doing. The staff is great. And if you live up in Washington Heights, they deliver! Happy Holidays from Male Martha! One of the reasons I've been writing less this year is youth hockey: spending every weekend going to a rink somewhere or other is is not the best way to find interesting food items. If I was writing a blog on rink food that would be another story, but a short, miserable one. Having said that, as boy 1 and boy 2 get older, we can often drop them at the rink to change while we do a bit of shopping. During a game in Brewster recently, we discovered Salinger's Orchard Farm Market in Brewster, NY. (Salingers Orchard, 230 Guinea Road, Brewster, NY 10509, 845-277-3521) a few miles from the rink. Salinger's sells their own apples, which were delicious. We bought two quarts of Fuji apples which never made it back to NYC. Because of their special storage facility, a wide variety of types are available year round. We also had their donuts (fresh out of the fryer not to be missed) and some baked goods (good). 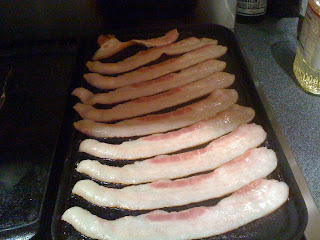 They also sold cured meats: we bought a pound of bacon (pictured cooking) from Mountain Products Smokehouse in Lagrangeville, NY. It was a really good piece of pork, but it was a bit oversalted. The meat was good enough that I would buy it again and rinse the meat quickly before cooking next time. So if your journeys take you to the northern extremes of Westchester County, I would strongly consider a stop at Salinger's. I wish I had bought more apples, and next year, when I have to go twice for hockey games, I surely will. I usually don't write negative reviews. Its not my speed: I'd rather just ignore the place. That's why my London posts were so few! But, after my meal tonight at Craft Steak, I feel that I really can't ignore this...the service and food were unacceptable for such a venture. I remember Tom Colicchio telling a contestant on "Top Chef" that people came to top flight restaurants for a special occasion, and that it wasn't fair to them to have a bad night. If the meal we had tonight was on Top Chef, it would definitely have been a "Pack Your Knives and Go" type of night for the chef who prepared it for us. We went for a special occasion: boy #2's birthday. Our entry into Craft Steak started with an indifferent greeting in the Las Vegas like space that is this restaurant (the decor and table spacing are the best part of the place, and are quite nice in a Gordon Gekko kind of way). Led to our table, we sat a bit, and then were asked our drink orders. We had some questions about the food and whether there were any specials, and the waiter told us that he would have a complete explanation when he came back. Some time after that, he came back and said "ready to order!??" We made him do the explanations. In summary, they have a "market menu" that changes every day and therefore there are "no specials." Very nice in concept, but the menu from November 29th that is posted on the internet is almost identical to the one we had....the differences being a few dishes or types of steak that you might even want to call "special" if you so desired. The Caesar salad was too fishy, the frisee with fried pork ear was fine. The marrow bones were good, but they were served on a giant plate of kosher salt. One slip of the fork and your marrow was toast (not on toast, as it should be). The dinner rolls were supposed to be a "better" version of the warm parker rolls that you can buy in the supermarket, but were lacking something that those rolls had. And they were dolled out as if they were gold. We did not have the Wagyu beef, but we did have a wide selection of other cuts: the porterhouse, strip steak, flat iron and hanger steak. The porterhouse was clearly the best, with the flat iron in a somewhat distant second. All of the steaks were salted in a way that could only be described as "variable." The hanger steak was like shoe leather. We had been there for almost two hours at the end of dinner (this is a steak house) and couldn't deal with it anymore. We paid and left without eating dessert. Needless to say, next time we go to Luger's, and if we can't get in Palm, Too. Moti Mahal in London: Excellent Indian Food! This occasional blog continues! We are just back from London, where we and a large group of others visited the famous friends in London for an auspicious family event. Surprisingly, it didn't rain till our last night there! While London, despite its residents claims, will never be known for its excess of quality food, there is some stuff out there if you try (really try). Our best meal while we were there was at Moti Mahal (45 Great Queen Street, Covent Garden, London WC2B 5AA, T: +44 (0)20 7240 9329 ), which is right by Covent Gardens. The restaurant is clearly an upscale affair, with prices to match (it is London, after all). The seats are great, and it is easy to carry on a conversation. About the only thing I didn't love was the menu, which is designed as sort of a Mogul travelouge but is sort of confusing. Fortunately, we were with some Indian friends, who took over the ordering process (and I would say did an excellent job). Unfortunately, even though I have a copy of the menu, I am trying to reconstruct what we ate as much as possible. First the good. The dal, relishes (included with the meal), bread and raita are quite good. The grilled lamb (49 pounds per kilo!!) is excellent. I was not a huge fan of the chooza (butter chicken) but it is clearly the right choice for the under 18 set. Chauchori, which is a mix of potatoes and baby eggplant, is not to be missed. Nor is the Bhala Papadi Chaat, which is a mix of pastry bits, chick peas, yogurt and mint chutney. If you are a fish fan, the Meen Polichathu, which is baked seabass and crabmeat served in a banana rapper. Now the not so good. Its a short list, but the biryani, at 19 pounds, was small, not very good, and, clearly, quite pricey. 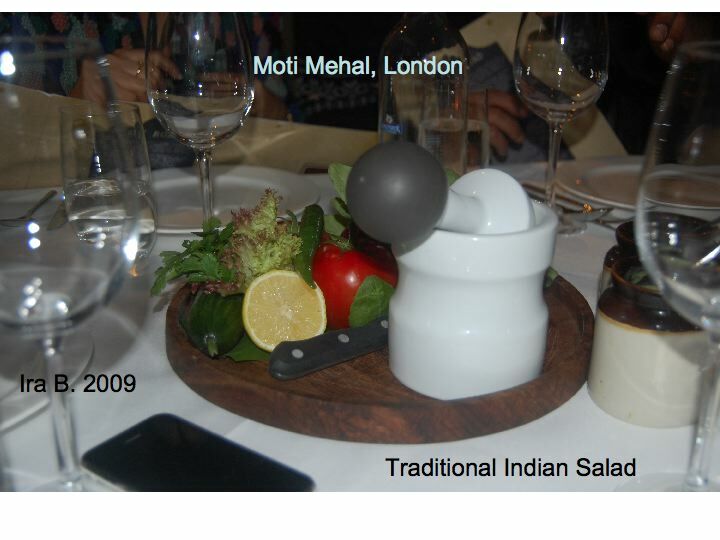 If you are going to London and want a decent meal do not miss Moti Mahal. I don't think I've had Indian food this good in New York. If you do know a place, let me know. I Like 5 Guys Burger! Yeah, I know the President of the United States went out and got his staff lunch there. But that's not how I ended up there the first time. We were actually in Connecticut, buying a national debt's worth of hockey equipment for the children and I was tired and hungry. We saw a sign for "5 Guys" and I actually thought it was going to be a diner. Because, in NY, everything with "Guys" in it inevitably is. So I was surprised when I walked in and in fact was in a fast food burger joint. But we were hungry, it was quick, and we ate. And I liked it. The fries were quite tasty, and the burger (a standard burger has two patties and the "junior" a mere one) was good. They also have hot dogs. There is nothing else on the menu: no shakes, no salad, no chicken, no vegetarian: there are in fact more guys than menu items. For a little extra, you can add bacon, cheese or of course, bacon and cheese. For free, you can have mustard, lettuce, tomato, pickle, onion, etc. etc. There are free peanuts while you wait. The burger does not sit around awaiting your arrival: it is cooked to order. There are currently three 5 Guys in Manhattan and one more is slated to open at 690 3rd Avenue. Today, after a hockey game, I was in the one in Long Beach, NY (on W Park Avenue). 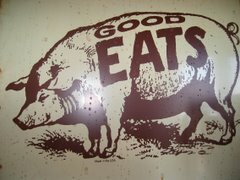 It was good, too! 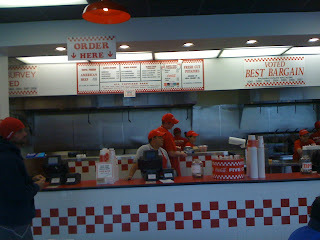 I think 5 Guys is the best chain burger I have eaten in a long time. The fries are superior to any other quick food restaurant I have eaten at (including the Parker Meridien, although Boy #1 disagrees with me). Its not 5 Napkin Burger (no relation, but review to come), but it really is a place to go if you need a burger out of town. Burgers at the Le-Parker Meridien: Pretty Good! Last night, the lovely wife, boy #2 and I went to the Shake Shack on Columbus and 78th Street. I had been to the one in Madison Square Park some years ago and been rather underwhelmed but decided to give it another go. No change. Although the hot dog (the Shack-ago. Get it. ha ha) was rather good, the burgers were small and a bit greasy. The fries were terrible, as in, for 1/2 the price you could have eaten McDonald's, which taste better and give you the same amount of heartburn. The shake was fine. I am not going back. All of this got me thinking about how good the burgers, fries and shakes were at Le Parker Meridien at 119 West 56th Street (212-708-7414). The four of us biked down there one weekend for lunch a few weeks ago. The fries were crisp and tasty and the burger was good, and I enjoyed them more as I continued to eat them. The heartburn factor was acceptable. And, since the place is full of tourists, its easy to get a seat if you are a pushy New Yorker (boy number 2 literally knocked over an FBI agent to get us seats!). The only thing you need to know is to bring cash. If you end up in Midtown North, I can think of far worse places to end up!